I am posting this a bit early and letting forum members sign up for a while before I promote off site. I'm still learning as I go with this. I will upload the promo poster before promoting offsite. VERY IMPORTANT!!! : Please do not sign up unless you are available to perform. If something changes, then please let us know in this thread as soon as possible. Booking a spot takes that timing away from other performers. It also leaves us scrambling to fill the empty spot at the last minute. 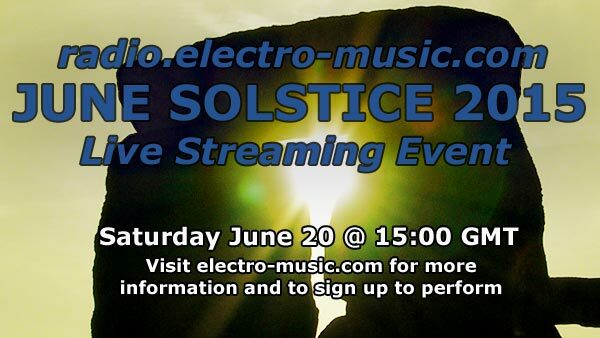 The event will be on electro-music radio on Saturday June 20, 2015. It will start at 15:00 GMT and end at 00:00 GMT. We can extend the timing a bit if we have enough people sign up, but lets try to start off in that range since it will maximize the number of listeners. It is IMPERATIVE that everyone test their connections before we start streaming. At least 24 hours before or sooner. Sorry, but musicians WILL NOT be allowed to stream if you do not test 24 hours before hand. Not only does it delay the schedule, but causes unneeded stress on performer, server operator, and audience during performance time. I will be moving the weekend before, but I should be able to at least do an improv with minimal gear. 6. Description (Style/Genre/Equipment, etc. - Optional): Improvisations on my DIY modular synth. Here is the signup promotion poster. I am going to promote off-site this week. It's Eric from the Balloon Marsupials. We're like to participate in the June 20th Streaming Event. Hi Eric. I am glad that you are playing again for this event. I will make a rough schedule this weekend. I am kind of busy right now with getting things ready to move. I will likely be performing my set with little to no practice ahead of time. I probably won't even have most of my studio set up by then. Muy buenos días! Hello everybody! We'd like to participate as well! 6. Description (Style/Genre/Equipment, etc. - Optional): Synthpop, Spatial, experimental, improvisations. Hi Kashmir. I am glad that you signed up again too. Here is the rough schedule of artists signed up so far. I will do some work today to get more signups. OK I'll sign up. It's been a half a year. 1. Preferred Start Time (Please use GMT/Military Time): Early in the event lineup, in case my wife wants to go out that evening. Somewhere in Paul's temporal neighborhood. 6. Description (Style/Genre/Equipment, etc. - Optional): some processed banjo picking and some algorithmic synthesis; will do both if I go 60 minutes. 2. Set Length:prefer 30 minutes but can do 60 if needed. 6. Description (Style/Genre/Equipment, etc. - Optional): Textural / Dark / ??? Should be easy with filling in a gap... it's going to go from 3am to lunchtime for me. As late as possible would be good, but I'm going to be busy from 8am (8pm GMT) onwards. Bloody awful random modular noodling, perhaps with a generic drum machine too. Cyno, if you wind up short of performers, I'll have a go, but don't expect anything particularly interesting from me I'd like to be lowest priority, so if anyone else can have a go, put them ahead of me. Will have to plan better for the next event. Due to a scheduling conflict, I will be unable to perform on Saturday. All the best to one and all -- hopefully I will be able to participate in the future. Thank you for the opportunity. I regret to say that I will not be participating. My slot is now available. I will be moving this summer, and this week and weekend I will need to spend a lot of time at the new house preparing for a renovation. Things have to move along as quickly as possible. I will also not even be able to tune in as the 'net isn't plugged in at the new place. So, I will be sad, but I'll catch up later. I updated the schedule with signups and cancellations, closed the gaps and added portnumbers. I put howard in for 1 hour since the saturday Twyndyllyngs sets always are that length so I hope that's possible. it can still be changed but the event is comming up fast. also PLEASE TEST YOUR STREAMS if you haven't already. Epicyclus tested his stream - I'll put a star in the previous post. Thanks for picking up the slack again Phobos. I was going to get to this today, but you beat me to it. I am all moved into the new place, but nothing is set up yet. I think that I will be literally performing on unpack boxes. It will be interesting.